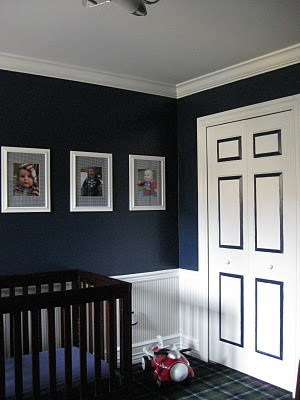 Lisa, a residential interior designer from the blog Hamptontoes has shared her lovely classical boy nursery with us today. I have followed her blog for some time and once I saw photos of her son's nursery featured on the Nate Berkus Show I asked her to share a few details about the design with my readers. 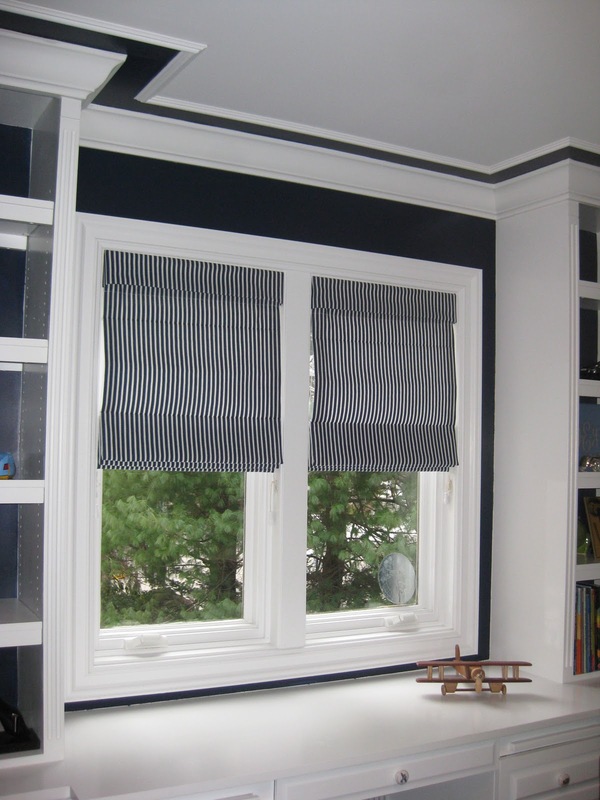 Take note of how the contrasted trim paint, pin stripe wallpaper, and patterned rug make this room extra special. 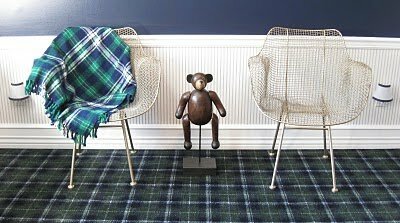 The inspiration for my son's room was the blackwatch plaid wool rug that is in his room. I wanted to create a room that was timeless, handsome, and stylish. 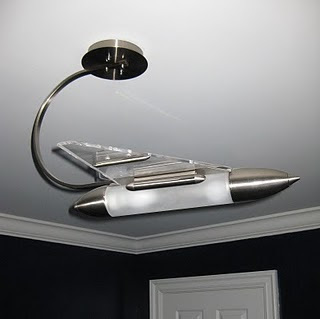 My first purchase was the satin nickel jet lighting fixture (pictured above)...it is boyish, without being juvenile. My daughter has a gorgeous chandelier hanging in her bedroom and I wanted to give my son an equally fabulous fixture, but one that was fit for a little man. 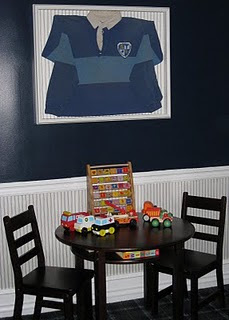 My favorite aspect of the room is the custom framing of my husband's medical school rugby jersey. If any man is going to be a hero to our son, I hope that man would be his own father. I gave a lot of thought to each element of his room before taking action on the design of it, so with that said I would not change a single element of his room. I love it and more importantly, so does he! Please share any sources if you can for the items used in the room. The built-in was in my son's room when we moved in. 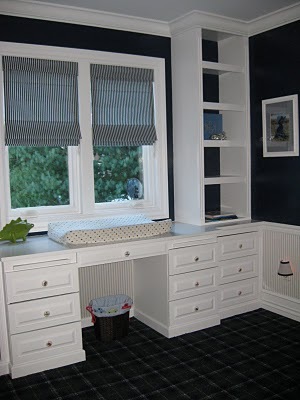 I utilized the desk as a diaper changing station with all the supplies tucked in the top right hand drawer. 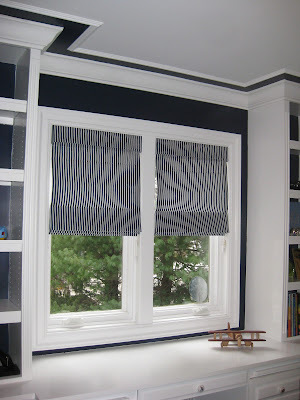 Lisa recently spiced up the design of the room a bit by adding some extra trim to the ceiling and painting the ceiling between the new trim and the existing moulding. 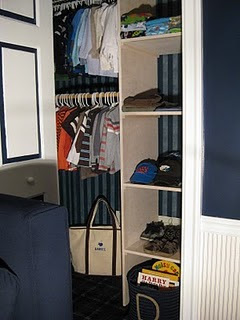 I love this touch and it makes the room that much more interesting and finished. A nice addition. (You can see the before photo above and the after photo below). This nursery is so perfect. Thanks so much for featuring my son's bedroom! I'm thrilled to be on your fabulous blog! We'll have to meet one of these days. 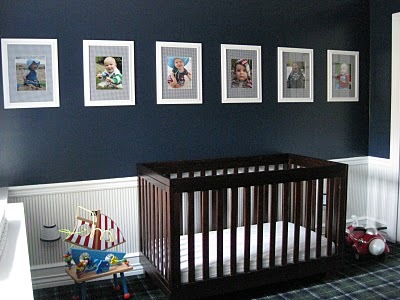 If Ralph Lauren were a baby, then this is how I would imagine his room! I love the way Lisa has picked out the architectural detailing - just gorgeous. absolutely adorable, timeless and he will be able to grow into it! love your blog, great ideas! What a classic room - I wish I had an ounce of vision like that!